Plot: A small town racer gets himself into the biggest underground, illegal street race of the year to avenge the death of his friend and take down his rival. 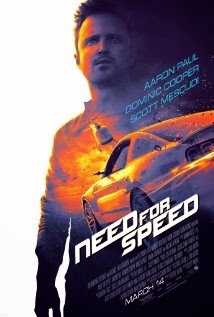 I was pleasantly surprised by NEED FOR SPEED. As far as car movies go, (and they are almost always horrible), this one was one of the best. Aaron Paul does a great job, Jesse Pinkman fans will not be disappointed. Incredibly, according to Aaron Paul, this movie is 100% camera caught, meaning no CGI or green screen technology was used. If that is the case, kudos to the director because some of the racing scenes are almost too amazing to believe. One warning on this movie: Watch your speed when leaving the theater. You'll want to tear up the asphalt like never before. Plot: A diverse group of moms bond over issues at the school their children attend and form a support group. This is nowhere near the best offering from Tyler Perry. It feels like this movie got rushed to print and the story was left in its wake. This film is overly dialogue heavy with some scenes lasting several minutes and never really going anywhere or adding to the story. Even the musical montage to move the plot forward, (usually no dialogue), has words written all over the screen. This is ultimately a relationship movie, but it's difficult to care about any of the relationships because they aren't developed well. If you want to see a Tyler Perry movie, I recommend saving your money and renting one of his better films.